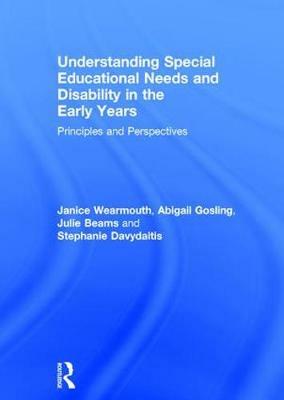 This key text provides essential tools for understanding legislation, policy, provision and practice for children in the early years, particularly young children with special educational needs and disability (SEND). Based on extensive research and the four areas of need as defined in the Special Educational Needs and Disability Code of Practice: 0 to 25 Years (DfE, 2015), the book charts the development of young children and their growing constructions of learning, communication, language, motor movement and emotion. Providing material that translates into practice in a straightforward and practical way, this text is packed full of personal accounts and case studies, enabling readers to appreciate what the experience of SEND in the early years means for families and professionals, and also to learn more about how they might understand and respond appropriately to a child's needs. Understanding Special Educational Needs and Disability in the Early Years will be of interest to students studying Early Years courses, families, SENDCOs, teachers and other staff supporting young children with a range of special educational needs and disabilities.